You will love bringing your children to play at one of our Vintage Township playgrounds! They are a great place to soak up a little sun and burn off some bundled up energy. 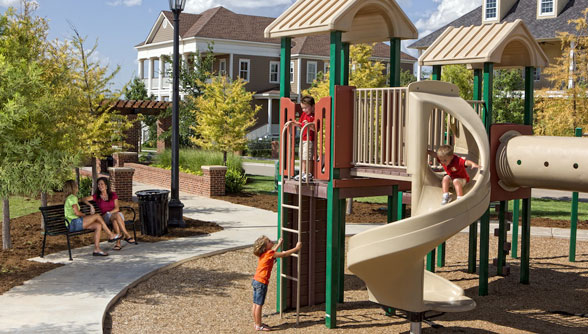 Your kids can slide,climb, run, jump and play with their neighborhood friends while you get to know the neighbors. Any time is the right time to have a play date at Vintage! 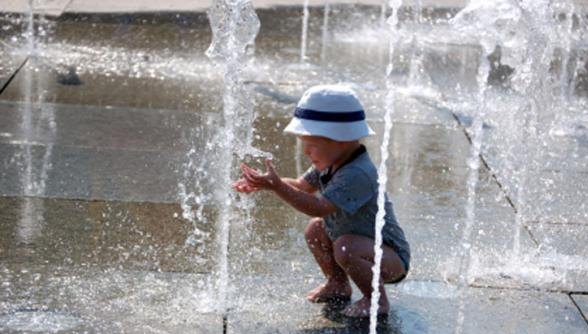 The Splash Pad at Salisbury Park is one of Vintage Township’s newest and most beloved new ways to cool off on a hot summer day. Neighborhood children dance and skip around the arching jets of water that spray into the air in delightful rhythm throughout the Spring and Summer. 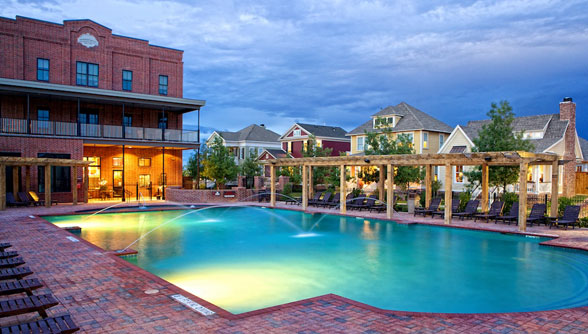 A beauty to watch in itself, this water feature is a one-of-a kind for Lubbock, and a wonderful new amenity you can only enjoy at Vintage Township. 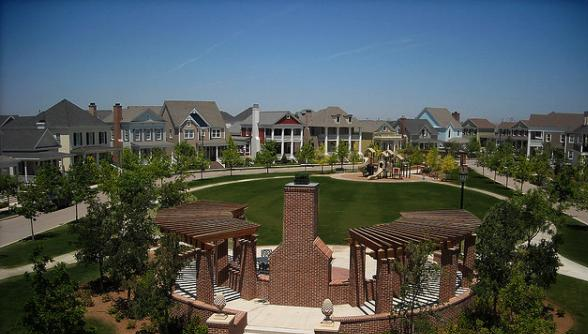 Founders Park is a great neighborhood space for outdoor living, serving as a great place to jog, play with your children, exercise your pets, meet the neighbors or take a quiet walk. 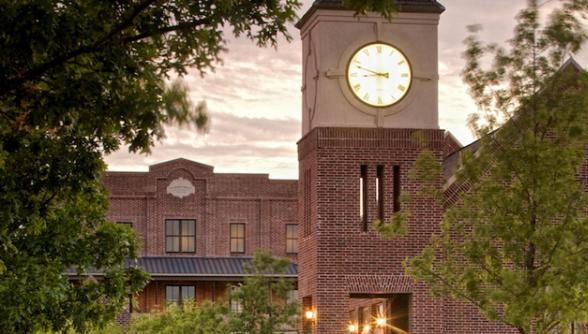 Year-round activities for residents and the community alike enjoy public theatrical and musical performances from Founders Park elevated stage, fairs and festivals on its palette of green grass. It’s also home to one of Vintage Township’s signature events, Winter Wonderland, including “magical” snow machines, Santa & Mrs. Claus, carriage ride and a synchronized light show. Founders Park also makes an ideal setting for weddings, festivals and other outdoor activities. 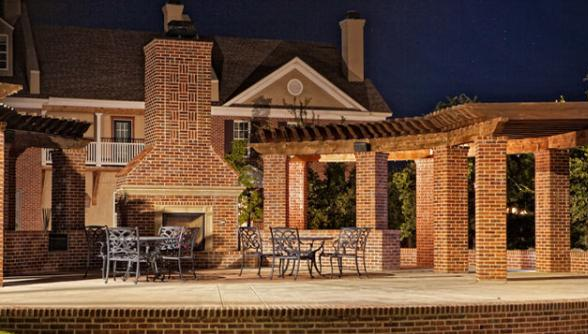 Whether you’re hosting a corporate party, a neighborhood get-together, or your favorite club or civic organization, the patio at Founders Park is a great venue. With plenty of space to serve your favorite goodies under the pergolas during a warm summer day and a fireplace to cozy up to in the winter, your friends will always want to come to your parties. Its dramatic architecture also makes it an ideal location for summer weddings and theatrical performances. This space is available for reservation by residents and the public by calling 806-782-4294. Need a place to improve your three-pointer or free throw? Score! 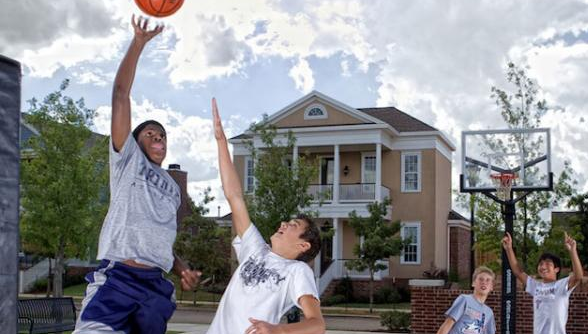 Vintage Township’s basketball court features a durable, yet flexible court that allows you to play for hours without sacrificing your jump shot. Pick-up game anyone? Whether you’re the type to just soak up the rays or you want to take a dip to escape the summer heat, the pool at Market Park is the place for you. With pergolas for shade and comfortable poolside chairs for relaxing, you could read a book while the kids splash and play to their heart’s content. A nearby fire pit also makes a great gathering space to enjoy a relaxing time with neighbors. Garden Courts are smaller parks within Vintage Township featuring lovely pavilions or other great outdoor living features. Its seating area makes an inviting setting to play cards or reminisce with family and neighbors over iced tea or lemonade or tea. Size is not a factor when it comes to a great play area for your kids, too. They’ll have plenty of room to run around with their friends and enjoy the manicured lawn. Town Hall is a destination all in itself. The spacious event room offers an open area framed by tall sunlight filled windows on all sides with a view overlooking the East Commons. Neutral wall colors and flooring make the perfect canvas for any decorative theme or color scheme. The exterior presents a sophisticated background with spacious areas for photos and a portico for additional event usage. Available to both non-residents and residents of Vintage Township. Anyone reserving the use of the Town Hall must sign an agreement and pay fees to hold the room for their reservation. This space is available for reservation by residents and public by calling 806-782-4294. 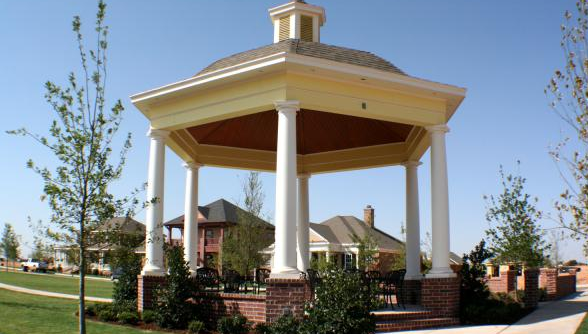 In true classic Southern elegance, the Gazebo at Salisbury Park is the perfect setting for relaxing in the shade while you watch the kids play in the Splash Pad or just for enjoying the park views on a warm Summer evening at Vintage Township. 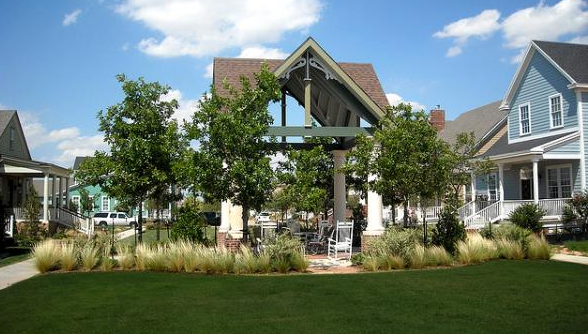 The Salisbury Park Gazebo also offers an ideal location for a casual musical performance and even as the centerpiece for a one-of-a kind Vintage wedding. The tree lined streets of Vintage Township are just one of the many features that make our community a special and unique place to live. 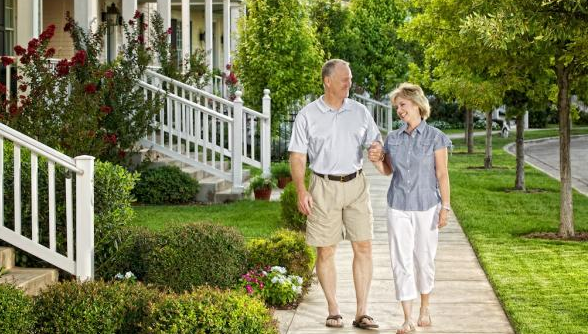 These beautiful red oak and live oak trees provide a beautiful addition to each home’s front yard landscaping as well as creating a lovely atmosphere for relaxing walks through the neighborhood.